According to Pivot charts, Nifty's key support level is placed at 10,088.97, followed by 9,927.13. If the index starts moving upwards, key resistance levels to watch out are 10,343.97 and then 10,437.13. The market rebounded sharply on Monday after losing more than 2.5 percent last week. The Sensex surged more than 700 points and the Nifty50 closed above 10,250 levels, driven by short covering in banking & financials after ICICI Bank's Q2 earnings. The Nifty50 after opening higher at 10,078.10 extended rally as the day progressed and touched an intraday high of 10,275.30 in late trade. The index almost recovered all its previous week's losses and closed 220.90 points higher at 10,250.90, forming large bullish candle on the daily charts. "Finally there seems to be some respite to bulls as Nifty50 clocked in a gain of around 2 percent before signing off the session with a long white day kind of formation. However, this rally appears to be driven largely by the financials on the back of short covering," Mazhar Mohammad, Chief Strategist – Technical Research & Trading Advisory, Chartviewindia.in told Moneycontrol. He said hence, sustaining above Monday's low of 10,020 levels this much awaited pull back rally can initially head to test its first critical hurdle placed in the zone of 10,408 to 10,436 levels. India VIX moved up by 2.48 percent to 19.71 levels. Volatility is not cooling down further and that is the only concern for the market. The Nifty50 closed at 10,250.90 on Monday. According to Pivot charts, the key support level is placed at 10,088.97, followed by 9,927.13. If the index starts moving upwards, key resistance levels to watch out are 10,343.97 and then 10,437.13. The Nifty Bank index closed at 24,959.70, up 538.65 points on Monday. The important Pivot level, which will act as crucial support for the index, is placed at 24,568.26, followed by 24,176.83. On the upside, key resistance levels are placed at 25,187.46, followed by 25,415.23. Maximum Call open interest (OI) of 18.78 lakh contracts was seen at the 10,800 strike price. This will act as a crucial resistance level for the November series. This was followed by the 10,500 strike price, which now holds 18.02 lakh contracts in open interest, and 10,700, which has accumulated 17.27 lakh contracts in open interest. Maximum Call writing was seen at the strike price of 10,400, which added 1.64 lakh contracts, followed by 10,700 which added 1.28 lakh contracts and 10,200 which added 1.06 lakh contracts. Maximum Call unwinding was seen at the strike price of 10,500, which shed 2.15 lakh contracts, followed by 10,100 which shed 1.82 lakh contracts. Maximum Put open interest of 38.79 lakh contracts was seen at the 10,000 strike price. This will act as a crucial support level for the November series. This was followed by the 10,200 strike price, which now holds 28.05 lakh contracts in open interest, and the 9,800 strike price, which has now accumulated 23.46 lakh contracts in open interest. Put writing was seen at the strike price of 10,200, which added 5.03 lakh contracts in open interest, followed by 10,000 which added 4.76 lakh contracts and 10,100 which added 3.65 lakh contracts. Maximum Put unwinding was seen at the strike price of 10,500, which shed 0.29 lakh contracts in open interest. 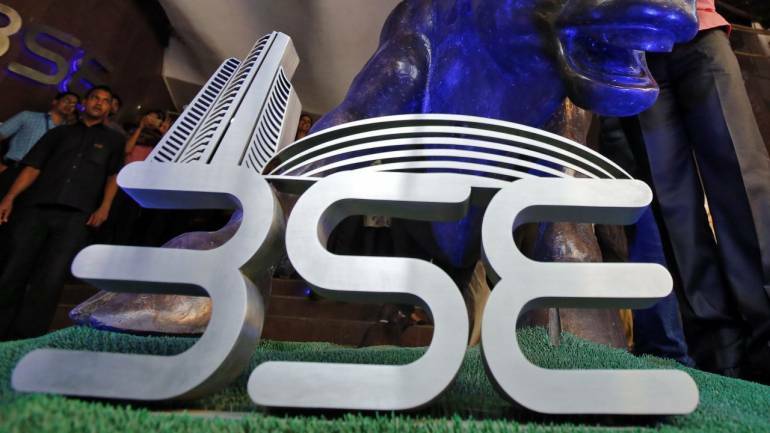 Foreign institutional investors (FIIs) sold shares worth Rs 2,230.79 crore while domestic institutional investors bought shares worth Rs 2,526.9 crore in the Indian equity market on Monday, as per provisional data available on the NSE. Kwality: Letko Brosseau Emerging Markets Equity Fund sold 40 lakh equity shares of the company at Rs 7.1 per share and Sanjay Dhingra sold 24 lakh shares at Rs 7.05 per share. Madhya Bharat Agro: Ostwal Phoschem India purchased 1.98 lakh shares of the company at Rs 45.13 per share on the NSE. Ujjivan Financial Services: Franklin Templeton Mutual Fund A/C Franklin India High Growth Companies Fund 11624 bought 10,52,508 shares of the company at Rs 184.44 per share on the NSE. India Home Loan: Board meeting is scheduled on November 5 to consider financial results for the quarter ended September 2018. CL Educate: Company scheduled an analysts and investors Quarter 2, Financial Year 2018-19 Earnings Call on November 5 to discuss the unaudited financial results (standalone and consolidated) for the quarter and half year ended September 2018. Mcleod Russel India: Board meeting is scheduled on November 12 to consider financial results for the quarter ended September 2018. UFO Moviez India: Board meeting is scheduled on November 12 to consider financial results for the quarter ended September 2018. Centrum Capital: Board meeting is scheduled on November 12 to consider financial results for the quarter ended September 2018. Autolite India: Board meeting is scheduled on November 14 to consider financial results for the quarter ended September 2018. Page Industries: Board meeting is scheduled on November 14 to consider financial results for the quarter ended September 2018. Fortis Healthcare: Board meeting is scheduled on November 5 to consider financial results for the quarter ended September 2018. S Chand and Company: Board meeting is scheduled on November 5 to consider financial results for the quarter ended September 2018. Sheela Foam: Board meeting is scheduled on November 5 to consider financial results for the quarter ended September 2018. Asahi India Glass: Board meeting is scheduled on November 5 to consider financial results for the quarter ended September 2018. RPG Life Sciences: Board meeting is scheduled on November 5 to consider financial results for the quarter ended September 2018. Renaissance Jewellery: Board meeting is scheduled on November 5 to consider financial results for the quarter ended September 2018. Sanghi Industries: Board meeting is scheduled on November 6 to consider financial results for the quarter ended September 2018. Astrazeneca Pharma: Board meeting is scheduled on November 13 to consider financial results for the quarter ended September 2018. Manappuram Finance: Board meeting is scheduled on November 6 to consider financial results for the quarter ended September 2018. Electrosteel Castings: Board meeting is scheduled on November 10 to consider financial results for the quarter ended September 2018. BL Kashyap and Sons: Board meeting is scheduled on November 10 to consider financial results for the quarter ended September 2018. GOCL Corporation: Board meeting is scheduled on November 13 to consider financial results for the quarter ended September 2018. NCC: Board meeting is scheduled on November 13 to consider financial results for the quarter ended September 2018. Shriram City Union Finance: Banking and Securities Management Committee meeting will be held on November 2 to consider certain terms of the issue, including the size of the issue. Bombay Rayon Fashions: Extra-Ordinary General Meeting to be held on November 22. MAS Financial Services: Company has scheduled a conference call with analysts and investors on Thursday November 1, wherein the management will discuss the financial results with the participants. Triveni Turbine: Board meeting is scheduled on November 1 to consider the unaudited financial results for the quarter and half-year ended September 2018 and also consider a proposal for buy-back of the equity shares. Sharda Cropchem: Conference call for analyst and investors is scheduled on November 1. Thomas Cook: Conference call for the analysts and investors is scheduled to be held on November 2. Shriram Transport Finance: Company's officials will be meeting analysts/investors on October 30, November 1 and 2. Siemens: Company's officials will be meeting Reliance Nippon Life Asset Management on October 30. Results on Tuesday: Tech Mahindra, Bank of Baroda, Dena Bank, ABB India, IDFC, Info Edge (India), IRB Infrastructure Developers, JK Tyre & Industries, Jayaswal Neco Industries, Talwalkars Better Value Fitness, Krebs Biochemicals, Accelya Kale Solutions, Alembic, Phillips Carbon Black, Blue Star, Gangotri Textiles, Vakrangee, Cummins India, Bhushan Steel, STI India, Ramco Cements, Pidilite Industries, Borosil Glass Works, Emami, Nitco, Eimco Elecon (India), NOCIL, Cholamandalam Investment, Gateway Distriparks, TCI Finance, Solara Active Pharma, GTL, Times Guaranty, Tata Global Beverages, JHS Svendgaard Laboratories, Unichem Laboratories, Kalyani Forge, Asahi Songwon Colors, Navin Fluorine, Take Solutions, Navkar Corporation, Opto Circuits, Orient Abrasives, Symphony, IFB Industries, BASF India, TD Power Systems, Indian Card Clothing, Shree Renuka Sugars, Bharat Gears, EIH, Binani Industries, Tata Teleservices (Maharashtra), Container Corporation, Esab India, Creditaccess Grameen, Bank of Maharashtra, Astra Microwave, Birla Corporation, JVL Agro Industries, Shemaroo Entertainment, Teamlease Services, Motilal Oswal Financial, R Systems International, Emkay Global Financial, Orient Refractories, Jindal Stainless (Hisar), Merck, Prestige Estates Projects, Kanani Industries, Dalmia Bharat, Manpasand Beverages, Electrosteel Steels, Hind Rectifiers, Redington (India), JMC Projects (India), National Fertilizers, Torrent Power, AksharChem India, Welspun Enterprises, 3M India, Future Market Networks, Landmark Property, Revathi Equipment. BPCL Q2: Profit falls to Rs 1,218.7 crore versus Rs 2,293.3 crore; revenue rises to Rs 82,884.82 crore versus Rs 82,430.93 crore QoQ. Just Dial Q2: Profit rises to Rs 48.38 crore versus Rs 37.46 crore; revenue increases to Rs 221.03 crore versus Rs 194.47 crore YoY. Finolex Industries Q2: Profit jumps to Rs 76.4 crore versus Rs 28.2 crore; revenue rises 14 percent to Rs 542.6 crore versus Rs 475.3 crore YoY. Nilkamal Q2: Profit drops 10.4 percent to Rs 24.9 crore versus Rs 27.8 crore; revenue increases 32.1 percent to Rs 613.7 crore versus Rs 464.7 crore YoY. Union Bank of India Q2: Net profit at Rs 139 crore versus loss of Rs 1,530.7 crore; net interest income increases 7.4 percent to Rs 2,493.1 crore versus Rs 2,320.7 crore YoY. Swaraj Engines Q2: Profit rises 8 percent to Rs 25.37 crore versus Rs 23.5 crore; revenue jumps 18 percent to Rs 247 crore versus Rs 208.7 crore YoY. Granules India Q2: Consolidated profit spikes 49.4 percent to Rs 60.2 crore versus Rs 40.3 crore; revenue jumps 48 percent to Rs 580.8 crore versus Rs 392.5 crore YoY. LIC Housing Finance Q2: Profit rises 11.5 percent to Rs 573.2 crore versus Rs 513.9 crore; net interest income increases 5.1 percent to Rs 1,012 crore versus Rs 963 crore YoY. HDFC AMC Q2: Profit rises 15 percent to Rs 205.9 crore versus Rs 179.8 crore; revenue increases 12 percent to Rs 480.4 crore versus Rs 430 crore YoY. Chennai Petroleum Corporation Q2: Profit falls to Rs 27 crore versus Rs 156 crore; revenue increases to Rs 15,084 crore versus Rs 12,355.8 crore QoQ. Sun Pharma Advanced Research Q2: Loss at Rs 2.58 crore versus loss at Rs 62.57 crore; revenue rises to Rs 61.35 crore versus Rs 15.36 crore YoY. HPL Electric & Power Q2: Profit increases to Rs 7.8 crore versus Rs 6.2 crore; revenue rises to Rs 286.5 crore versus Rs 224.2 crore YoY. Ballarpur Industries Q2: Consolidated loss narrows to Rs 142.64 crore versus Rs 293.67 crore; revenue rises to Rs 936.7 crore versus Rs 586 crore YoY. Chambal Fertilizers Q2: Profit rises to Rs 145 crore versus Rs 144.3 crore; revenue increases to Rs 2,486 crore versus Rs 2,108 crore YoY. Mahindra Holidays Q2: Profit falls to Rs 14.46 crore versus Rs 31.70 crore; revenue declines to Rs 209.4 crore versus Rs 240 crore YoY. HSIL Q2: Profit dips to Rs 4.67 crore versus Rs 23.50 crore; revenue jumps to Rs 622.65 crore versus Rs 531.3 crore YoY. DCM Shriram Q2: Consolidated profit falls to Rs 167.72 crore versus Rs 172 crore; revenue rises to Rs 1,700 crore versus Rs 1,605 crore YoY. Man Industries Q2: Profit jumps to Rs 15.21 crore versus Rs 9.35 crore; revenue surges to Rs 803 crore versus Rs 284.3 crore YoY. Thirumalai Chemicals Q2: Profit rises to Rs 53.1 crore versus Rs 46.31 crore; revenue increases to Rs 363.4 crore versus Rs 311.50 crore YoY. Action Construction Equipment Q2: Profit increases to Rs 12.4 crore versus Rs 11 crore; revenue jumps to Rs 344 crore versus Rs 251 crore YoY. Sagar Cements Q2: Consolidated loss at Rs 8.01 crore versus profit at Rs 8.54 crore; revenue rises to Rs 257.7 crore versus Rs 235 crore YoY. Tata Power: Company revised issuance in one or more tranches, of non-cumulative, redeemable, taxable, listed, rated securities in the form of non-convertible debentures (NCDs) upto Rs 5,500 crore on private placement basis. Cadila Healthcare: Company has subscribed 51 percent shares of Windlas Healthcare Private Limited (Windlas) as per the share purchase agreement executed by the company and Windlas. Windlas has become a subsidiary of the company. Sunteck Realty: Company issued commercial paper of Rs 25 crore. Minda Corporation: India Ratings and Research upgraded company's long term issuer rating to AA- from A+. Sagar Cements: Board appointed Dr S Anand Reddy, currently Joint Managing Director, as Managing Director and S Sreekanth Reddy, currently Executive Director, as Joint Managing Director. Bharti Airtel: Company said IPO preparations are proceeding as per plan, new board is in place with new investor’s representatives and company remained very confident about the IPO process. Tanla Solutions: Company retained former Airtel CEO Sanjay Kapoor as senior advisor and mentor for its growth strategy and appointed Sriram Vinjamuri as Chief Operating Officer. For October 30, Adani Power is present in this list.